Welcome to Dvreem, a simple, diceless "pencil and paper" storytelling game for two people. The sample setting of Creagadier blends fairy tale and steampunk themes. Both are designed to encourage fun and memorable adventures involving only a single protagonist. Playing the game requires these rules, paper and pencil, and two people eager for stories of adventure and humor. 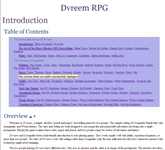 Dvreem and Creagadier form a kid-friendly introduction to role-playing games. They work equally well with adults, experienced gamers, or more than two people. The rules of Dvreem work with settings other than Creagadier (only the four skills that describe how characters interact with technology might need changing). The two people playing Dvreem have different roles. One acts as narrator and the other is in charge of the protagonist. The narrator describes the setting and controls everything in the story except the main character. The other person makes all of the choices for the main character. The game is diceless so it can be played anywhere. No need to gather a big group of game-playing friends: you and your best friend or spouse should be able to play it when on a walk, relaxing in the spa, or wrestling with giant snakes while exploring lost ruins. Alternate rules that use dice are provided because some players (especially young ones) really enjoy how dice contribute to suspense and the thrill of victory, and because colorful sets of polyhedral dice are nifty.